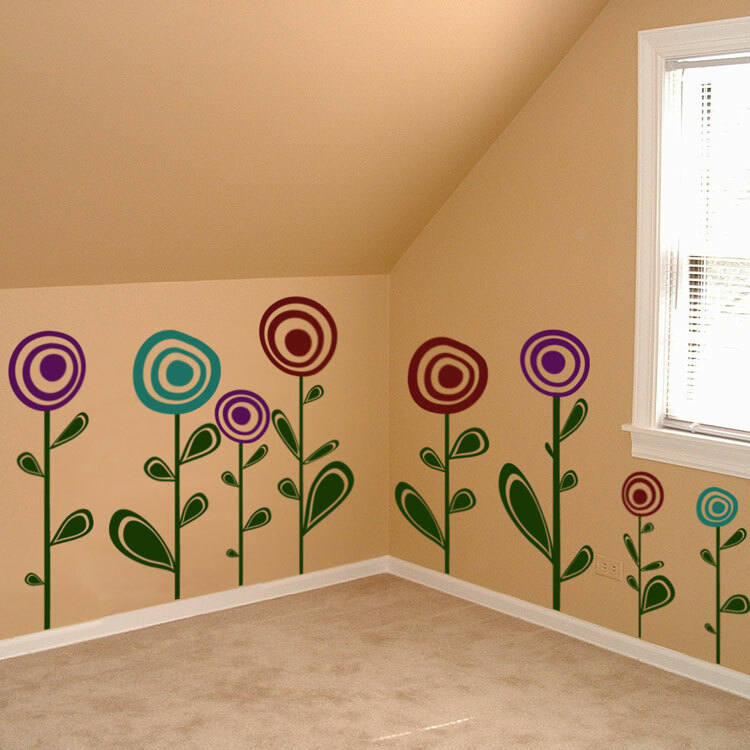 Our cute circle flower wall decals are great for kids' rooms, play rooms, apartments, or any space that needs a little life added to it! Available in a variety of color combinations, these flowers will complement your decor and brighten up your space. These flowers range in size from 12 to 40 inches high. You will receive 14 flowers, even though only 8 are pictured. Available in the colors of your choice! Our Cute Circle Flower wall decals come separately so that you can place and arrange them however you choose! This is absolutely gorgeous! Thank you so much for all the constant contact, and really making sure I love the piece. The shipping was incredibly fast, and I love the extra special goodie! It's going to look too cute in her room! I can't wait to buy more from you as soon as we get settled into the new house! I just love these decals. I am so indebted to Dali Decals for solving my decorating dilemmas. There are times when you just can't find the right something or you can't find the perfect picture with the right colors. I love them in children's rooms...they are a breath of fresh air. Picture frames can get a little stuffy. Thank you for just great customer service as well. It's been a great experience! Great customer service!! Wasn't happy with the color of my monogram letter decal and they happily exchanged the color for me HASSLE FREE!! Thank you!! Bought the Exotic Sakura Decals and just applied them to my wall today - LOVE THEM! This was my first attempt in doing this - watched a video; followed your directions and it came out BEAUTIFUL! It is very easy to apply and even though this particular decal had parts to match up - it wasn\'t difficult to join them flawlessly.